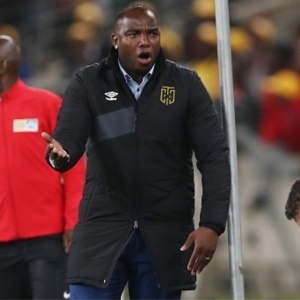 Cape Town - Cape Town City coach Benni McCarthy admits losing the MTN8 final was a bitter pill to swallow after SuperSport United triumphed on penalties at the Moses Mabhida Stadium on Saturday. The Citizens were defeated by their former coach, Eric Tinkler, as Matsatsantsa won 4-2 in a penalty shootout after a 1-1 scoreline following 120 minutes of football. However, with Thabo Mnyamane forced off the field of play due to injury after his late equaliser, United rallied with 10 men for the remainder of the fiery encounter - which McCarthy commended after the game. "Football makes grown men cry hey. Listen, I can't fault the boys today you know. They gave everything. Unfortunately things didn't go our way," he told SuperSport TV. "We had chances to kill off the game but you know we were playing against an experienced side, they're going to ride the wave. We could see that they were playing for penalties and yeah the boys ran out of gas I guess. "We played right into SuperSport's hands, they had cramps, a player going off injured, we couldn't capitalise playing with an extra man. "But you know what I'm super happy for my boys. Unfortunately it was not to be but now we just keep on pushing because we've shown that we can compete against the top teams. We gonna continue to do so, better luck next time." With regards to his unpopular decision to substitute crowd favorite Teko Modise after an inspiring midfield display from the veteran, McCarthy explained his thought process behind the move late into the second-half. "Teko you have to manage him. We don't want to see him end up breaking down again," he added. "We save him and as the season continues he will grow stronger and better. That's all there was to it, there was nothing (untoward) about it."